“Just another brick in the wall!” Arvind changed his facebook status message using his Smartphone and he knew the inevitable flood of questions from his network would follow. He was bugged. His status “Da man has arrived – now EA to the Prez!” a week back, had gotten him over 70 ‘likes’ – a personal record. But it didn’t take a doctorate in human psychology to figure out that he was not really hitting it off with his boss. “The man just refuses to think differently or even consider there is a better way of doing things. He wants everything to be ‘thought through’. That approach is so-dead” Arvind ranted over a Whats-App chat session with his close friend. Arvind had slaved the entire weekend and come up with a detailed presentation outlining what he felt was a massive improvement over the current process. “Don’t try to fix what isn’t broken” is all that the president said when he shooed Arvind out of the room after having barely glanced at the presentation slides. Up on the seventh floor of the corporate office: The president once again opened the presentation his EA had sent him. He was impressed with the way the young entrant had tried to use new technologies to reduce some of the inefficiencies in the process but what was also obvious was that the impatient young man didn’t have the depth of understanding required to overhaul the entire process chain. In the good old days a new comer would immerse himself for years before daring to come up with a plan to overhaul an established process and this was the fifth time in the last week alone that Arvind had come up with a ‘game changing’ plan – none of which was really necessary right now. There were more than enough burning fires that needed putting out. “This new generation thinks it can change the world overnight”. The president shook his head as he picked up the phone to call the HR head. The tech-savvy, socially conscious, instant result seeking Gen-Y comes across as impatient, impertinent and even at times incompetent, to senior executives. Most of the decision makers and leaders are not yet quite comfortable dealing with the new constantly-connected generation that uses search engines to find information (and consequently solutions to problems) like none of them have. 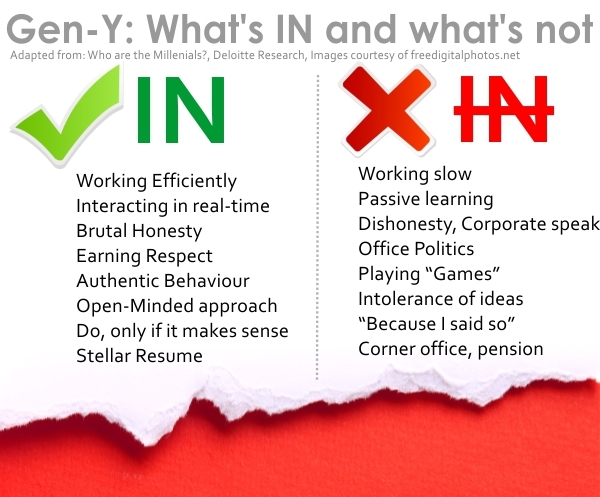 To engage with Gen-Y, leaders need to first understand the traits they exhibit in the workplace. Having grown up in a time where information is available instantly through various sources, this generation is much more aware of the happenings around them, both in the world of business and outside of it. They are inherently collaborative: The millennials are much more likely to be team-players than the generations before them. There are various reasons for this. Technology has developed to an extent where a vast amounts of information is, easily available. But this deluge can also be overwhelming. Collaborative teams are able to make sense and act on this flood of information much better than an individual could possibly hope to – besides this generation is largely inclusive and entrepreneurial in their approach towards solution finding. Team work is both an outcome of the behavioural characteristic and the goals of this cohort. Unlike Gen-X, this group is less individualistic and work well with mentors. In fact they expect (and cherish) instant constructive feedback on their work and value guidance from their seniors. They are impatient and expect respect: Orders are not very effective with this group. 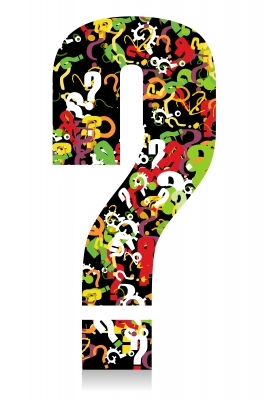 The answer to their “why?” is not “Because I told you so.” Or “Because that’s how it has always been done.” This generation thrives on flexibility and the need to challenge status-quo. Partly driven by the desire to make a difference – to their workplace, to the community, to the world and partly due to the fact that they are innovative thinkers, this generation does not take kindly to a slow and unwieldy way of working. They are used to being blunt about facts and expect the same from their superiors and peers. A marked behaviour change in this generation, rising out of their social networking lifestyle, is the tendency to give respect only where it is due. For Gen-Y seniority is not an automatic qualifier for respect – with this group one has to ‘earn’ it by actually demonstrating results. They are driven by success and strive for work-life balance: Unlike the previous cohorts, Gen-Y has a strong focus on their work-life balance. Spending long hours at the workplace is not a ‘given’ for this generation. While working hard when required to meet their goals comes naturally to this group, it is not a given that the goals of the organization is necessarily the same as their personal goals. As I had mentioned in the first post of this series, management today has a unique challenge of building engagement strategies that take into consideration the characteristics of three very distinct generations in the work force. With Gen-Y the overarching theme in engagement is “transparency”. In the third and final post in this series I will outline some of the strategies that has evolved out of research into the engagement of Gen-Y in the workplace.